Air Force Base Ysterplaat in Cape Town hosted Africa Aerospace & Defence for the second time in 2008. The five day event, which took place from the 17th to 21st of September, consisted of three trade days followed by two public and airshow days. Africa Aerospace & Defence is the premier aviation and defence-related air, sea and land technology and services exhibition on the African continent. Exhibition space was sold out weeks before the event and more than 200 exhibitors from about 25 countries were present. The exhibition brought together exhibitors and senior decision makers from across the globe. With an increased emphasis on joint ventures and technology transfers, exhibitions like AAD play a central role in creating and maintaining aviation and defence-related business relationships. 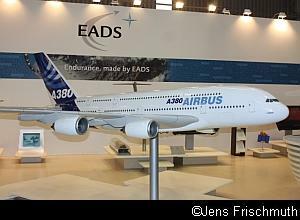 Commercial aircraft manufacturers like Boeing, Airbus and Embraer and military technology companies like BAE Systems, Airbus Military and Lockheed Martin were present. However, due to the exorbitant costs of flying demonstration aircraft out to South Africa, most of the marketing took place via large scale models. International flying displays were limited to a couple of USAF C-130s and two Zimbabwean K-8 trainers. 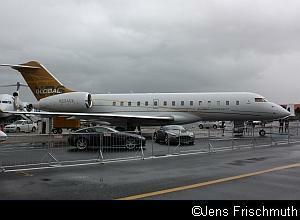 Static displays were numerous and included everything from light aircraft to business jets. The largest plane on display was a Boeing 727 and planes like the Dassault Falcon 7X and the Bombardier Global XRS were seen in the country for the first time. A special hard stand area was created for the aircraft of the Cape Town branch of the SAAF Museum. Many of the planes, which are normally housed inside the air force base hangars, are not generally accessible to the public as they are stored in a restricted area which forms part of an operational Air Force Base. On the first trade day, the ceremonial hand-over of the new Gripen fighter to the South African Air Force took place. After a formation flypast by all four Gripens Ds delivered to South Africa so far and a solo display by the SAAF Gripen test pilot, Lt. Col. Charl Coetzee, a ceremony followed in which the (then) Minister of Defence, Mosiuoa Lekota, handed over the Gripen fighters to the Chief of the South African Air Force, Lt. Gen. Carlo Gagiano. The Silver Falcons launched their new colour scheme at a special function at AFB Ysterplaat on Tuesday, the 16th of September. Six aircraft had been repainted in the new blue and white colour scheme over the previous couple of months, but the new colours were kept a closely guarded secret until their official unveiling. The striking new colours portray a falcon's head and wings. 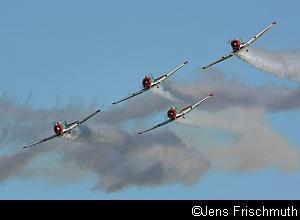 This is the first time since their Impala days that the official display team of the SAAF had their own colour scheme. The flying displays at Africa Aerospace and Defence are always something special and the spectators who attended the two airshow days saw some awesome formation displays and brilliant individual performances that will be remembered for a long time to come. The South African Air Force flew just about every plane in its inventory, spearheaded by its new air superiority fighter, the SAAB JAS-39 Gripen. 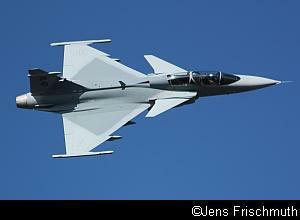 All four Gripens delivered so far were present at AAD and Gripen 04 was used as the display aircraft for the show. It flew two superb displays each day in the capable hands of the SAAF Gripen test pilot Lt. Col. Charl Coetzee. The performance advantage of this 4th generation fighter over older generation aircraft is immediately visible. The increased power and far superior turning capabilities of the Gripen make for a far tighter display and the pilot can perform impressive maneuvers whilst keeping the plane within easy sight of the spectators. 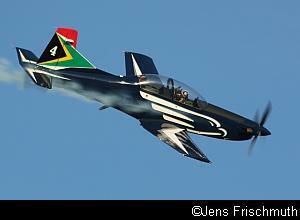 Two SAAF Hawks, painted in the colours of the South African flag, were also present. The Hawk was demonstrated twice daily in solo displays flown by Lt. Col. Ivan Pentz. A Hawk also participated in the "mini-wars" on the weekend. 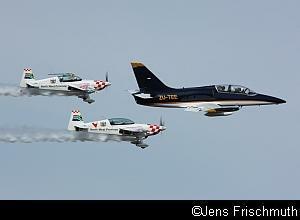 The official display team of the South African Air Force, the Silver Falcons, flew in their new colour scheme for the first time. Also, the Silver Falcons were expanded from a 4-ship to a 5-ship team again. The new position of Falcon 5 was entrusted to Maj. Nico Frylinck. The Sunday morning display marked the last performance of Maj. Alex MacPhail in the number 3 position, who left the team to join SAA. His seat was taken over by Lt. Buti Tsebe, who flew his first public display for the Silver Falcons in the afternoon. SAAF helicopters featured prominently in the displays. 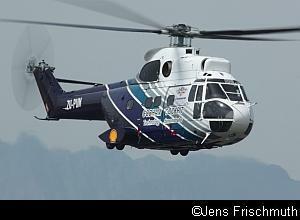 The newly acquired Super Lynx helicopter made its public debut at AAD 2008. Bk117s performed formation displays, as did the Agusta 109 LUHs. The Agusta 109 was also displayed individually and the solo display ended with the spectacular release of flares. The Rooivalk did solo displays and also flew a formation display with the Russian-built Mi-24 Super Hind. This "East meets West" attack helicopter formation display was another airshow first. 16 Squadron, which operates the Rooivalk, brought a portable hangar to the airshow. This hangar can be dismantled in a couple of hours, packed into containers and transported by truck to different parts of operational areas as required. Around midday on both airshow days, the SAAF and army demonstrated its operational capability by staging a Heli-ops mini-war. The crew of a "downed" Bk117 helicopter in enemy territory had to be rescued quickly. A Hercules C-130 immediately performed a short landing and deployed troops and light transports to the area. A CASA 212 dropped supplies by parachute and Oryx and Super Lynx helicopters brought additional troops to the battlefield. The troops immediately "dug in" and started to secure the area with mortar fire and hand-held weapons. To protect the troops, a Rooivalk attack helicopter provided close air support and a SAAF Hawk dropped bombs and secured the airspace overhead. Once the area had been cleared of enemy troops, the helicopter crew "in peril" was hoisted to safety by Super Lynx and Agusta 109 helicopters. At the end of the display, all helicopters that had participated in the operation took part in a formation fly-past. 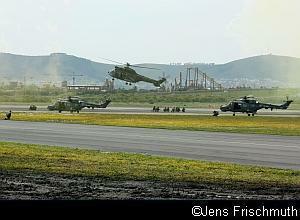 The first formation of 10 helicopters consisted of 4 Agusta 109s, 3 Oryxs, 2 Bk117s and a Rooivalk. 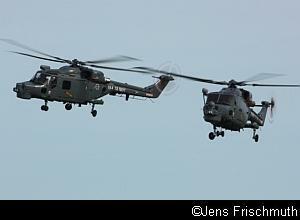 The second formation of 5 helicopters consisted of 2 Super Lynxs and 3 Oryxs. 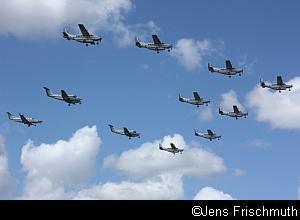 Another impressive formation display was flown by 41 Squadron, which is a light transport squadron. The squadron demonstrated the 100% serviceability of its planes by putting all its available aircraft into the air at the same time. The formation consisted of 8 Cessna 208 Caravans, 2 Beechcraft King Air B-200s and a Pilatus PC-12, which was flown by the Chief of the South African Air Force, Lt. Gen. Gagiano. The fly-past ended with an impressive formation break. Large airliners performed various displays. The largest plane flown was the Boeing 747-400 belonging to the Saudi Prince Alwaleed bin Talal bin Abdul Aziz Al-Saud. This is the largest business jet in the world and the Prince will be the first owner of the VIP version of an Airbus A380 in future. 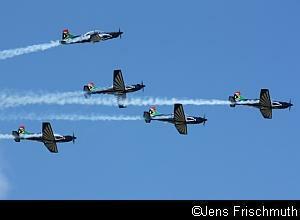 Highlights were the formation displays of South African Airways Airbus A340-600 airliners and the Silver Falcons. 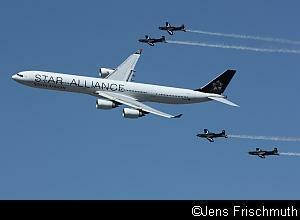 On the Saturday, the Airbus flew in Star Alliance colours and the Sunday display was performed by an Airbus in SAA colours. The formations ended with formation breaks by the Silver Falcons and the A340s were then displayed individually. These amazing displays were sponsored by Rolls Royce, Airbus and South African Airways. 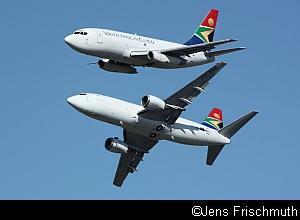 Another airshow first and for many the highlight of the show was the formation flown by two SAA Cargo Boeing 737s. The 737-300 was flown by the father and daughter team of Scully Levin and Sally Bates and the 737-200 was flown by Pierre Gouws and Colin Gibson. The two large planes flew their display wingtip to wingtip, performed an amazing break and did a double touch-an-go to the delight of the crowd. Thunder City added a special touch to the airshow. Ian Pringle, Mike BeachyHead and Dave Stock flew the Shell Formation consisting of a Hawker Hunter, a Blackburn Buccaneer and an English Electric Lightning. After the 3 planes completed a few circuits together, all three planes performed individual displays in turn. The second Thunder City formation consisted of a dual English Electric Lightning display. The two jets flew together and then alternately flew individual passes along the crowd line. 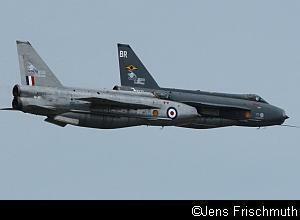 The Saturday display ended with Lightning XR773 climbing to altitude and breaking the sound barrier above Ysterplaat. The thunderous double sonic boom was felt as far away as Hout Bay. Unfortunately, because of complaints from residents in the area, this feat would not to be repeated on the Sunday. Thunder City also displayed its upgraded Puma helicopter, ZU-PUM. This Puma was modernised by Thunder City and features a state-of-the-art Chelton glass cockpit suite. Thunder City, in association with Cobham, is the only AMO (Aircraft Maintenance Organisation) offering this upgrade. It is intended to bring the outdated technology of Pumas flying around the world in line with the systems used in newer helicopters and is a cost-effective alternative for owners who do not want to invest in a new fleet of helicopters. The Extra 300 formation team of Nigel Hopkins and Larry Beamish flew their usual high impact aerobatic show. The control of the pilots is amazing and they make extreme maneuvers look easy. 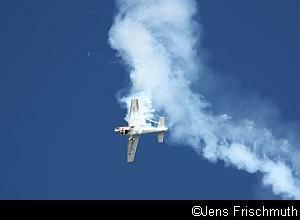 Zoltan Verez, the Hungarian aerobatic pilot, then performed a world class solo display when he took over Larry Beamish's Extra 300. Zoltan is one of a select few pilots who is cleared to perform displays right down to ground level. The safety regulations at the event prevented him from going below the 300ft limit set for all pilots, but his display was truly amazing. The display started at high altitude with stall turn and end-over-end rolls and ended at low altitude with impressive flypasts that included knife-edge passes. The Flying Lions in their Harvards are always a crowd favourite and the team of Scully Levin, Arnie Meneghelli, Ellis Levin and Stu Lithgow performed brilliantly again. There is still nothing that beats the sound of the Harvard's Pratt and Whitney radial engines. Another treat for Harvard fans was the solo display flown by Harvard #7231, which belongs to the Ysterplaat branch of the SAAF Museum. Pierre Gouws flew individual displays in the Czech-built L-39 Albatross jet ZU-TEE on each day. On the Sunday, Pierre flew renowned photographer Frans Dely in the L-39 for a photo shoot of the Airbus A340/ Silver Falcons formation. The amazing photos of the formation over scenic Cape Town subsequently appeared in various magazines. Towards the end of the airshow on the Sunday, the L-39 and the two Extra 300s took off in formation from Ysterplaat and did a joint fly-past lead by the L-39, after which they departed to their home bases. Unfortunately, the SAAF Museum's Mirage IIICZ did not take part in the flying displays on Saturday and Sunday after being damaged on the Friday. Glen Warden suffered a bird strike whilst approaching to land at Cape Town International Airport after completing his validation flight. 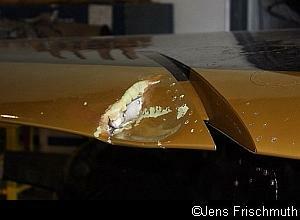 The impact with the seagull caused serious damage to the leading edge of the Mirage's wing and the aircraft had to be grounded for the rest of the weekend. This was the only incident of an otherwise highly successful event.